Though retired to Lake Koronis, Frank Ziegler stills practices his profession - international banking - by making overseas trips to teach marketing and finance skills to producers in developing markets. Ziegler, a native of St. Paul, got into international banking back in the 1960s, after returning from a two-year stint in the Peace Corps in Columbia. At that time, midwestern banks were just starting to get involved in international transactions, which interested him. So after two years in Omaha, learning the rudiments of finance, he started at First Bank in Minneapolis, financing imports and exports. "The fact that I could stay in the midwest and have an international career really attracted me," he said. For most international transactions, bank involvement is necessary to facilitate the transfer of funds from one currency to another. Ziegler worked with the importing and exporting of machinery, equipment, and a host of other things. One of his main areas of work was acquiring oil for the refinery in St. Paul. After five years, he switched from international banking to agribusiness, still specializing in overseas transactions. "One thing I liked about banking was you learned a little about a lot of businesses," said Ziegler. "There was a lot of variety in it, even though the longer I stayed in it the more specialized I got." 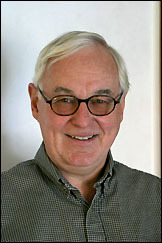 Since 1994, Frank Ziegler has taken 20 trips to teach banking practices in developing markets. Most of his trips have been to Russia, Kazakhstan, Hungary, and Bulgaria. Ziegler made his first month-long trip to Russia five years before retiring, in 1994 with the USDA. He went to teach about warehousing receipt financing, something not popular in the United States, since most farmers store their own grain and sell it when the price is beneficial, but something with which Ziegler was familiar due to his overseas experience. After 75 years of Communism in Russia, neither farmers used to collective methods, nor their bankers, were ready to successfully market their crops. Most wanted to sell any surplus immediately, said Ziegler, and most did not have any method to store their crop to wait for a better price. By warehousing their crop, they could safely store their crop and wait for better prices. 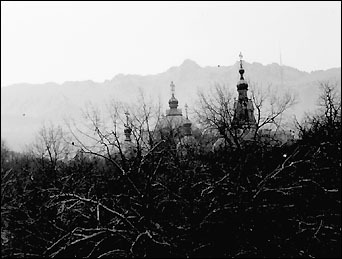 Since that trip Ziegler in 1994 has made return trips to Russia as well as trips to Bulgaria, Croatia, Hungary, and Kazakhstan. Last summer he spent two weeks in Kenya. In all, he has made around 20 trips in the last ten years, some lasting a week some lasting a month. About three-quarters of these trips were done on a volunteer basis, estimated Frank, meaning that only his expenses were covered. The other quarter he was actually paid as a consultant. Along with a continuing interest in his profession, these trips feed his interest in international affairs and introduce him to more foreign cultures, he said. He enjoys working abroad, even though the trips are actually a lot of work and leave precious little time to sightsee. 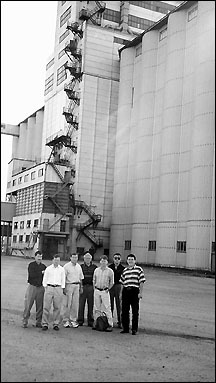 Frank Ziegler, who retired in 1999 and moved to Lake Koronis in 2000, is pictured with colleagues in front of a giant grain elevator in Kazakhstan. 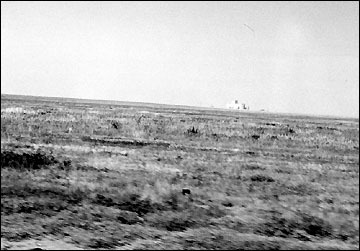 The grain elevator, part of the collective farming system in the Soviet Union, is also shown on the prairie above. For Ziegler, these trips are a way to get out of the house and much better than sitting on a beach, he said. "It is work. It's a lot of fun, but it is work,"Êhe said. He also enjoys meeting people, not as a tourist, but in a professional capacity. "You really get an appreciation for the problems they have," Ziegler said. "The population of Kenya, they told me, had quadrupled in the last 25 years. So the problems had quadrupled, too." In 2004, he wants to go to Romania on a consulting trip. Ziegler was an English major at St. John's University who served two years in the Peace Corps in Columbia, going in 1964 and coming home in 1967. He worked at a linguistics institute in the Ministry of Education in Columbia, training secondary school teachers in the methodology of teaching English. He has gone back to Columbia several times since his Peace Corps stint, including in 1975, when he and Kathleen adopted a daughter from there. "It's a dicey place to travel, and I know a lot of Columbians who don't like to go back," he admitted, but he feels that the odds for safe travel still favor individual tourists. The interest that fueled his Peace Corps service led him to international banking, which he still maintains now with a couple work trips each year. In addition to traveling, Frank likes to golf, fish, and bake bread, bagels, buns, and baguettes.